There have been several court case wins and further humiliation for “Mad Mike” Weatherly in Brighton recently. 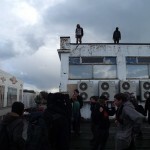 Firstly, all people accused of “Squatting a Residential Building” after September 2012’s squat raid have been found innocent, with two squatters having no case to answer and a further one acquitted on appeal. Also, the state admits that it’s OK to call Mike Weatherly a coward! After a 4 day trial, the only person to face charges after Mad Mike was chased off Sussex Uni campus in Nov 2012 was acquitted. 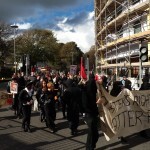 Indymedia article on these recent developments here. Sussex Uni have compiled a report accusing Weatherly’s group of being hysterical ninnys here. This website is now in hibernation. Up the squatters! 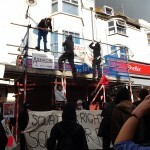 Today (23/11/12), a squatter was arrested for “affray” over the Mike Weatherley action on Sussex Uni campus. This is just a quick heads up to those who attended the action on Wednesday 14th Nov. The Police are investigating the events of that day. If you were involved, it may be best to change your appearance or “lose” the clothes you were wearing. It doesn’t look like the police have much evidence… most likely this’ll be the last we hear of it. We’ll keep you updated. Mike Weatherley, Tory MP for Hove, was due to do a lecture today at Sussex University, in Brighton. 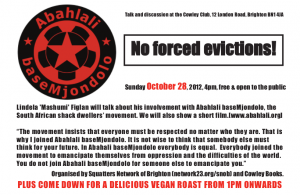 He was invited by the Sussex Uni Tory Society to talk about the squatban that he championed. Surprise surprise, it didn’t go very well! Around 50-100 students, squatters and their supporters decided that they weren’t going to let him speak. He’d barely walked onto campus before he was mobbed by a chanting crowd. His security and aides struggled to protect him as he fled, chased by a mob throwing eggs, tomatoes and other things. With no cops in sight, people were really showing their anger. Weatherley repetedly shunned debate with any squatters before he criminalised us. This is the only time he has talked in public about squatting, people tried to let their voices be heard through the government consultation on squatting, which came out as 90% opposed to banning squatting, this is why a broad range of people chased him off campus today, there were students, squatters, and supporters present. He eventually fled into the Silverstone building and locked himself in the room, besieged by the mob. Public order pigs turned up, and Weatherley was bundled into the back of a van. He was driven away at high speed as people blocked, hit and chased the van. Meanwhile, other squatters and supporters occupied the lecture theater he was supposed to speak in, and gave their own, pro-squatting speech to rousing cheers. 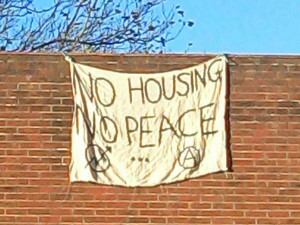 The building was also coated in pro-squatting posters and a banner saying “No housing, no peace!” was dropped from the roof. All in all, an amazing day out! A very quick update on today’s mass squatting action. It was AMAZING! Some pixies dropped a banner off of the front of the Darkside ex-squat, a massive building on Western Road was occupied and coated in banners, and the march ended up at a newly squatted art gallery on London Road. More to come tomorrow, when we’ve had time to recharge! 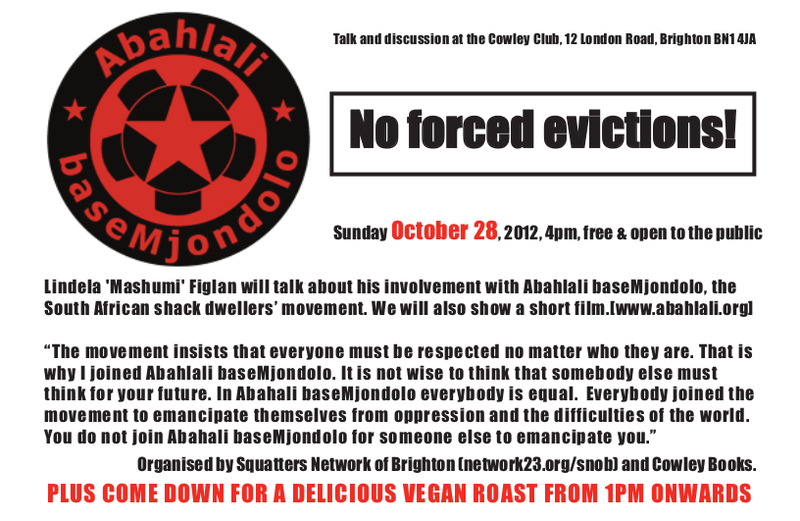 On Sunday October 28, the Squatters Network will be cooking a delicious vegan roast at the Cowley Club. Food will be ready from 1pm. Then at 4pm we are excited to host a talk from Lindela Figlan, a member of Abahlali BaseMondjolo, the South African Shack Dwellers movement. On October 13, solidarity with France! – to go on with with coordinating collectives and groups, with the planing of new meetings, an information and action network. – an action week-end all other France from October 13th till 15th, simultaneous actions against all forms of evictions. People involved with La Patate Chaude (Grenoble), Réseau 22 rue des Alpes (Grenoble), Les mal-logés acharnés (Paris), CREA et campagne de réquisition (Toulouse), GPS (Toulouse), Collectif Urgence Précarité 44 (Nantes), Intersquat Montpellier, Mission squat médecins du monde, La Petite Rockette (Paris), L’art ou Libre (Fontenay-sous-Bois), Abris d’Urgence Totale (Toulouse). 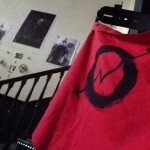 Photo-journalist Alec Smart, ‘Conceptual Architect’ Alex Casper and members of the Squatters’ Network of Brighton discuss activists’ use of alternative media as publicity, protest and direct action. 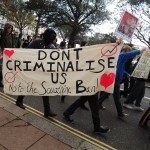 Focussing on the recent history of activism in Brighton and Hove, speakers will consider the possibilities and limitations of films, zines, newspapers and art exhibitions as political tools. 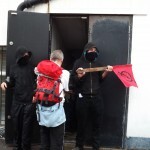 Sussex Police Liaison Officers (@SusPolPLO) have made numerous attempts to contact squatters in the run-up to the demonstration. These coppers (easily identified by their baby-blue bibs) are simply a re-incarnation of the notorious FIT (forward intelligence teams), who regularly filmed and harassed activists on demonstrations. Whilst PLOs do not carry cameras, they are still intelligence gatherers. They may approach you on the action and try to engage you in conversation. Remember kids: THERE’S NO SUCH THING AS A FRIENDLY CHAT WITH A PIG! If they’re trying to talk to you it’s because they’re trying to find out things about you. Don’t talk to them, don’t engage with them, and if possible physically challenge their presence on the action. Block them with banners (or umbrellas), FITwatch style. More info on PLOs here. While you’re in Brighton you may want to take advantage of our beautiful sea-side town and take in some of the sights. Here’s just three you may want to visit, there’s plenty more! Mike Weatherley MP was the architect of the squatban. An all round scumbag who has carried out a vicious campaign of hate against Squatters and multiple Brighton based activist groups. Why not pay him a visit? Sol “Zero Tolerance” Gilbert (the owner of the above gym) was responsible for a particularly nasty illegal eviction earlier this year. Him and some of his Cagefighter buddies turned up at a squatted building, kicked the back door in and threw the squatters out on their arses. His cohorts also stole a rather nice crowbar. Following the eviction he boasted about it on his twitter account. Why not go round and tell him what you think of this? 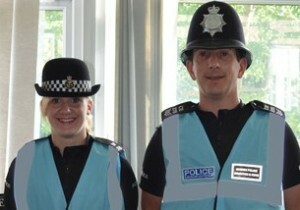 Squatters are Sussex Police’s favorite people. 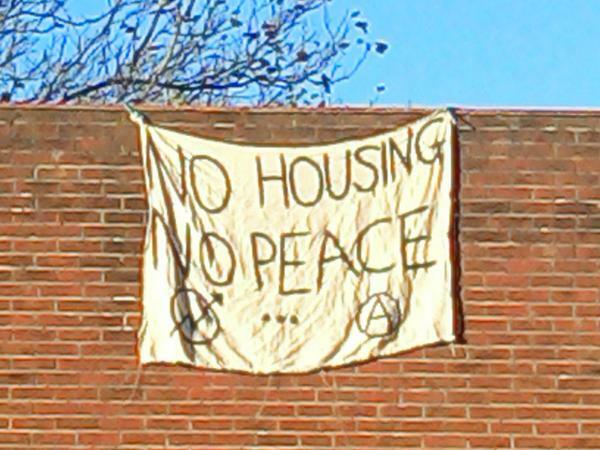 They’re never mean to us or evict us or anything… Seriously though, police in Brighton have a long history of vindictively targeting squatters. There have been evictions and arrests too numerous to count, most recently their particularly judicious application of the squatban (here). Go and visit their imposing copshop on John Street in central Brighton for a nice day out!